About: London's small but intimate 12 Bar Club showcases around 4 acts a night, 7 nights a week, from solo performers through to full bands. That's a lot of music, and with the emphasis placed on song writing, we feature artists from around the world and cover a wide range of genres. Please check out our listings section for upcoming shows. 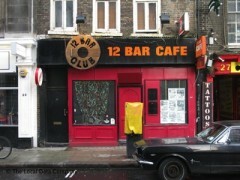 It’s not just the location on the legendary Denmark Street that makes the Twelve Bar Club so highly regarded. It’s the bands and the tunes they play. An eclectic lineup from rock and roll to skuzzy garage rock graces the intimate bar from night to night and rarely disappoints. "Rough round the edges, but truly London"
The 12 Bar Club is pure rock ‘n’ roll. The ground is uneven, the walls are peppered with photos of rock stars, the toilets stink, and the beer is cheap. The stage is so small at times band members have to play amongst the crowd, the rest of the room is comparable to the size of your living room. However there’s something about the dinginess that appeals to performers, for this is truly a musician’s music venue. In the past Jeff Buckley and the Libertines have played here, and it’s located in ‘Tin Pan Alley’ aka Denmark Street, an epicentre of rehearsal rooms, recording studios and guitar shops. There’s a pool table for those disinterested in the live bands, which play every night and lean towards rock, blues and folk. Food is served until 9pm too and is particularly inexpensive. The club stays open till 3am and is therefore a good spot for a cheap late night drink though admission fees apply, but these are usually around £6 - £7. A place to gather for (rock) music lovers, down to earth drinkers and wannabe musicians, the 12 Bar Club is rough and ready but a true London experience nonetheless. A great place to go to see bands in a pub atmosphere. I have been here on the weekend and have paid six or seven pounds to see five decent bands. The staff are very friendly and the drinks are cheap. awesome place, we either set out to london to get there, or we end up there after a night's tour of london pubs. always play great music and is full of great, open minded people.